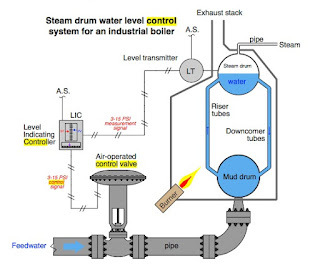 Control valves control fluid in a pipe by varying the orifice size through which the fluid flows. 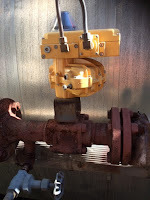 Control valves contain three major components, the valve body, the positioner, and the valve actuator. The valve body provides the fluid connections and movable restrictor comprised a valve stem and plug that is in contact with the fluid that varies the flow. The valve actuator is the component that physically moves the restrictor to vary the fluid flow. 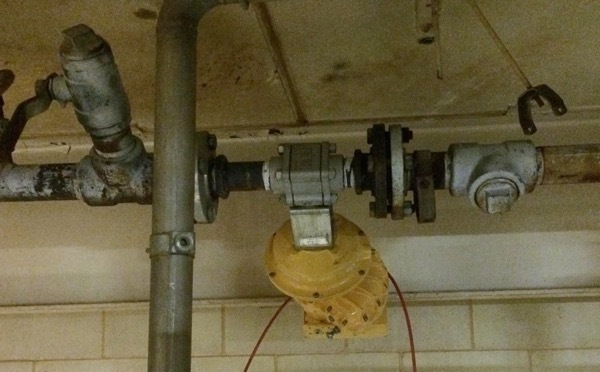 Their are two general categories of control valves - linear and rotary. Three actuator types are used in linear control valves including spring and diaphragm, solenoid, and motor operated. Three actuator types are used in rotary control valves including pneumatic, electric, and electro-hydraulic. Rotary actuators are sometimes referred to as "quarter-turn" or "partial-turn". 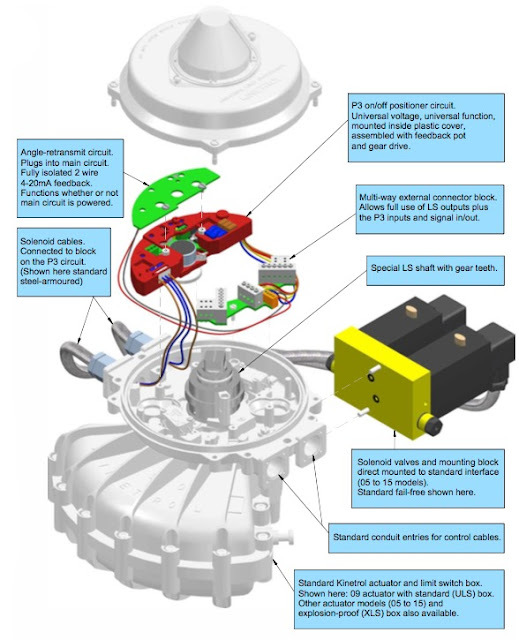 The valve disc (restrictor) controls flow through the valve body. A positioner receives information from a supervisory controller advising wether or not the flow condition is satisfactory. 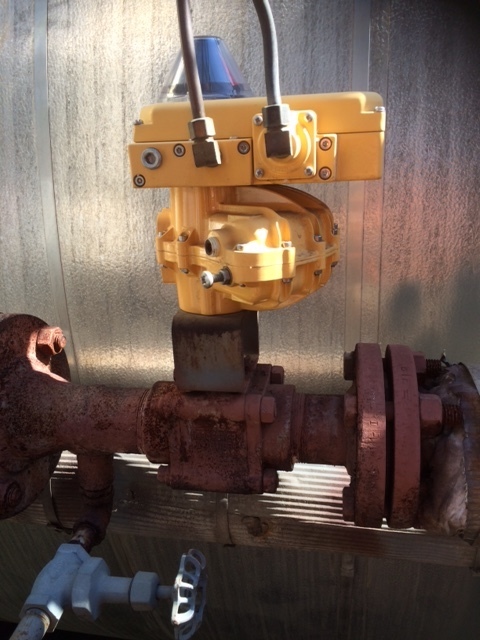 The positioner then provides a signal to the actuator that provides the force to open and close the valve. Each type of positioner works in response to a process signal. Some positioners (linear) use a 3-15 PSI pneumatic process signal. The pressure is exerted on a large diaphragm creating downward force that is applied against a spring which moves the restrictor up and own. Other types of positioners use a 3-15 PSI pneumatic signal to regulate a higher supply pressure (such as 0-60 PSI) to move pistons or vanes back and forth (rotary). The variable 3-15 PSI control signal can be provided directly by a pneumatic controller connected directly to the process, or in other cases the 3-15 PSI is regulated by an electropneumatic device called an I/P or E/P (current to pressure or voltage to pressure) transmitter. 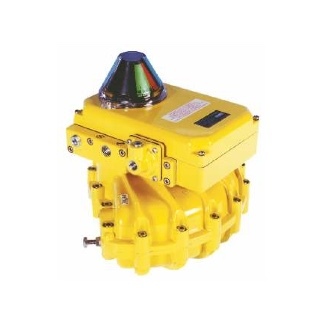 These transmitters receive their signal from a supervisory control as a 0-10VDC or 4-20mA and then throttle the 3-15 PSI output to open/close the valve. * Image courtesy of Tony R. Kuphaldt from "Lessons In Industrial Instrumentation"
The Kinetrol P3 On/Off positioner consists of an electronic positioning circuit mounted in a robust all-metal enclosure, which controls a 1⁄4-turn rotary pneumatic actuator via standard on-off solenoid valves direct-mounted on the actuator’s own interface. The P3 circuit is designed so that its assembly can be mounted inside a standard Kinetrol limit switch box (either ULS-type, or explosion proof XLS-type), using only two screws. 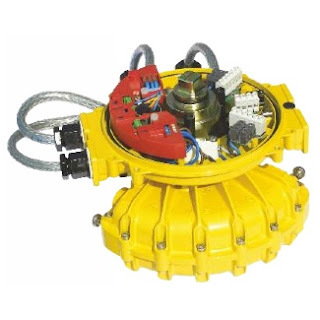 The P3 assembly is complete with feedback potentiometer and anti-backlash gear drive, which engages with gear teeth on the limit switch coupling to read the actuator’s position. The limit switch coupling complete with gear teeth needs to replace the standard coupling if a standard box is being retrofitted with a P3. Double acting models are available as fail-free (standard), fail-down (moves clockwise on loss of electrical power if air supply is still present) and fail-hold (holds position on loss of electrical and / or air supply) variants. Spring return models move in the direction of the spring on loss of electrical failure, but hold position on loss of air. An external pressure switch (which cuts electrical power on loss of air pressure) should be fitted by the customer if spring function is required on loss of air and / or electrical power. An optional angle retransmit (AR) circuit can be retrofitted by plugging it into the top of the positioner circuit and fixing with three screws. The AR circuit is a 2-wire loop-powered 4-20mA device, which reads the position of the positioner’s feedback pot. It is fully functional whether or not the positioner circuit is powered, and the feedback signal is electronically isolated (ie. floating) relative to the low voltage positioner circuit (which in turn is electrically isolated from the power supply and solenoid connections). Extra solid-state switches have been incorporated on the positioner board to allow supply to both solenoid valves via a single cable for movement to the upscale position when the positioner is in spring-return or fail-down mode, while still allowing the positioner to control the two valves independently for the mid position. If the mid-position input is energised, then these extra switches isolate the solenoids from the upscale/downscale inputs. The three power input lines (for up, mid, down positions) are independently fused using plug-in miniature fuses on the positioner circuit board. If an angle retransmit circuit is fitted using the low voltage signal terminal, optional 4-20mA inputs or external setpoint pot wires can be connected either directly to the terminal block on the positioner circuit or, if only three or less limit switches are in use, relayed through an unused limit switch terminal on the connector board. Industrial solenoid valves which permit the use of standard quality air supplies (instrument quality air is not required) are direct-mounted on adaptor blocks on the side of the actuator, and electrically connected via steel-armoured flying leads with DIN sockets on the solenoid end. At the positioner end, they connect to two 2-way terminal blocks on the circuit board. A range of solenoid valve options are available, determined by the function required, the supply voltage, and whether or not the unit requires hazardous area certification. Robust modulating actuator, control tolerant of standard air quality (instrument air quality is not necessary). Three position rotary control using only three electrical inputs plus air supply. Control circuit mounts inside standard all metal industrial quality Kinetrol ULS or XLS limit switch boxes without disturbing limit switches – available fully assembled, or (on non-explosion proof models only) for user retrofit to existing boxes. Explosion proof options available (approved to IECEX, ATEX; FM (for USA & Canada) standards pending) by use of XLS housing plus standard explosion proof solenoid valves. All new positioner circuit – runs on any of 24vDC, 48vDC, 115vAC or 230vAC power without any change required. Solid-state universal-voltage solenoid switching – no mechanical contacts. Positioner has user-adjustable zero, span, deadband and damping parameters via preset pots for easy optimization of positioning performance. Damping parameter gives velocity-proportional setpoint advance to allow better stabilization of fast-moving or high inertia loads while maintaining resolution and repeatability.